David Landwehr, owner of Constance Marina on the Ohio River, wanted to create a more attractive riverside entrance to his facility that would be able to withstand the riverbank’s harsh environment. 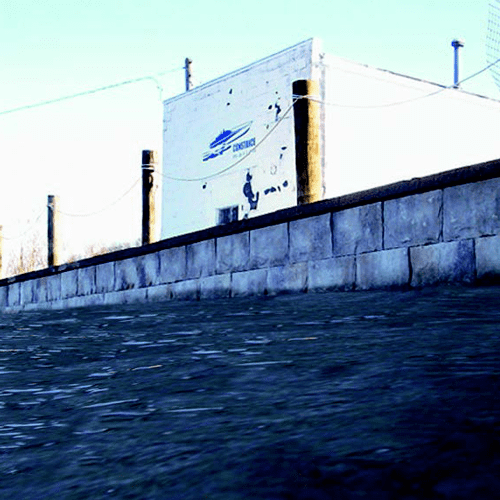 The 10 foot Belgard® Mega-Tandem™ gravity wall installed on the bank of the river was recently put to the test when it successfully withstood a 20-year flood event, with waters cresting less than 6 inches below the top of the wall and no resulting signs of distress or degradation of the wall system. Just around the river’s bend from downtown Cincinnati, Constance Marina is a 45-boat, dry dock storage facility with a vision to become a social gathering space for boating enthusiasts before, during and after enjoying a day on the water. The first obstacle in the marina’s evolution, however, was an unusable and unsightly hillside. From a landscape management perspective, the slope was challenging to maintain – so steep, its grass could only be tamed by a hand-held weed whacker. From the water’s view, the land was unkempt and unwelcoming. While a typical solution would be a segmental retaining wall, the marina had an additional consideration; adjacent to the hill is an outdoor living space with a patio and outdoor fireplace used by guests, and a segmental retaining wall install would require excavation of that land to stabilize the wall, destroying the existing patio and adding to the time and expense of the land improvement. Belgard® Mega-Tandem™ Mass Retaining Wall (MSRW)™ system requires no installation for excavation, offered the visual appeal of a natural stone appearance, and created an extra 1,890 square feet of outdoor space for the marina. The size and mechanical structure of Mega-Tandem™ allow for building walls up to 15-feet high and gravity walls up to 10 feet without reinforcing. Patent-pending positive mechanical connectors in the system allow for high gravity walls without a surcharge, so no excavation is needed. This is a major advantage for project sites where utility lines or property lines abut the project. For Constance Marina, it meant the existing outdoor living space was spared. “It’s a concept that’s different than anything else out there,” says Curt Derichs, PE, of Civil Design Professionals, a national earth retention design firm, who designed the retaining wall. Mega-Tandem™ panels are 12”x 24” and weigh 65 pounds per panel, which is a benefit according to Dave Landwehr of Structures Hardscapes Specialists, a national civil design build specialty construction firm. Because of its weight, the block also can be installed by hand, eliminating the need for bigger equipment. 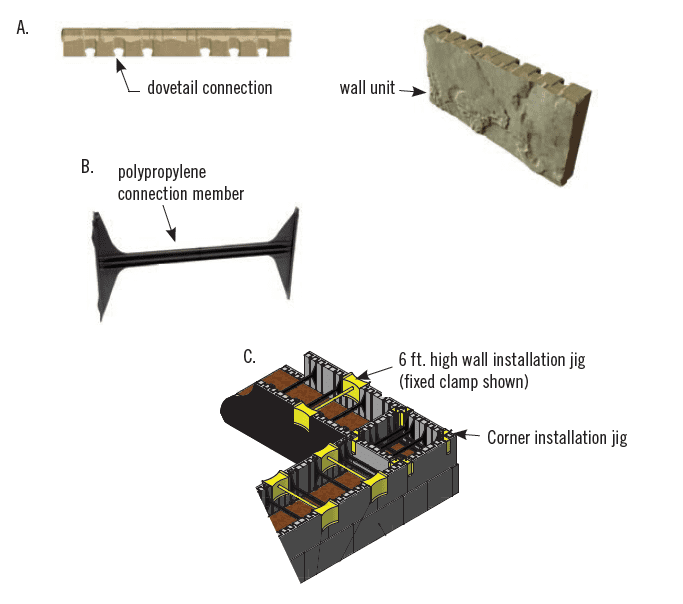 The reinforced polypropylene connecting members of Mega-Tandem create structural integrity in curved or straight retaining and freestanding walls, and the system has a running bond configuration, so no patterns are required. Meeting ASTM standards (C-1372 and C-1262), Mega- Tandem has an 8,500 psi compressive strength concrete and can offer in excess of up to 10,000 psi, making it suitable across the country, even in the coldest environments where it can withstand harsh freeze-thaw cycles. 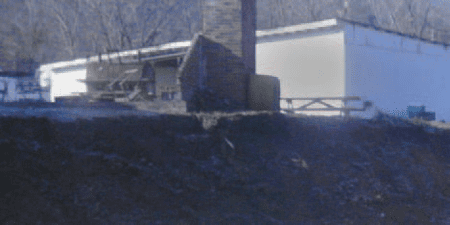 This benefit was a factor to consider for Constance Marina since it sits in a flood plain in the Ohio Valley and the retaining wall would be completely under water if the Ohio River were to flood. “Mega-Tandem’s size is an advantage for smaller contractors, but its durability is a plus for even the largest jobs installed by national contractors like Structures (Hardscape Specialists) ” Derichs explained. “We took an unattractive hillside and made it a functional, serviceable space,” said Landwehr, who is also the marina’s owner. He purchased the property nine years ago for the location and functionality of the buildings. His renovations include a tiki bar already under development on a water barge at the marina, and he is looking at plans for a restaurant. “It’s a gorgeous wall – it looks great and gives the marina a fi nished look from the water.” Landwehr said. Mega-Tandem is available in three color blends, and also comes in 12 different facial textures with the classic look of natural chiseled stone. No staining is necessary. Constance Marina is featuring the wall block in Margeaux Beige. As the snow laid down by Winter Storm Thor was hit by a wave of warmth on March 8, 2015, the Ohio River began to fl ood, cresting a foot above fl ood stage, approximately halfway up the Constance Marina’s new gravity wall. The water began to recede, but with the addition of heavy rains over the following week, the river rose again and eventually crested at its highest level since 1997, completely submerging the wall except for the cap. The water remained at this high level for two days before beginning to recede. Marina owner, David Landwehr, monitored the performance of the wall during the fl ood event and until the water completely receded to the base of the wall. Throughout, Belgard’s Research and Development division conducted rigorous internal testing during the development of Mega-Tandem, the team was proud of the product’s performance during this natural event. 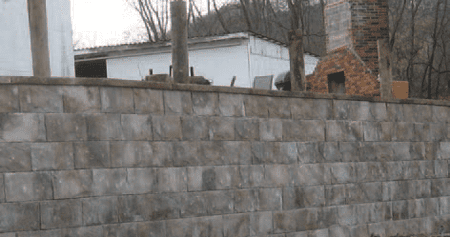 “Anytime you get into these types of applications with a new product, there is always an unknown factor until it’s tested in a real-life situation,” said Al Pfannenstein, National Retaining Wall Manager for Belgard. 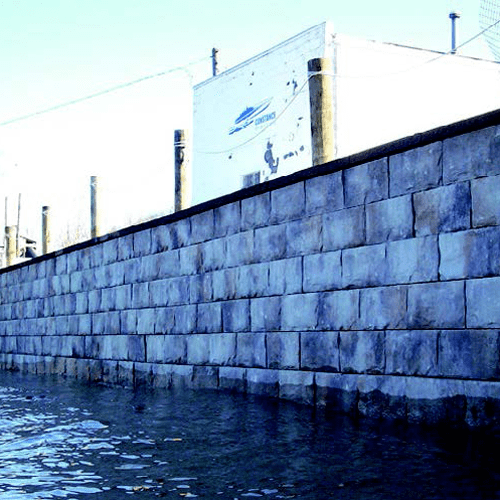 “Mega-Tandem was designed as a flood wall, and now we have solid evidence of its strength and durability in the field. With the system in hand, Structures was able to build a 126 ft. long/10 ft. high gravity wall with no reinforcement. A. The Mega-Tandem Wall Unit with dovetail connection. B. The Polypropylene Connection Members, designed for walls up to 6-feet and 10-feet in height. C. Mega-Tandem Wall jigs, for wall or corner installation.